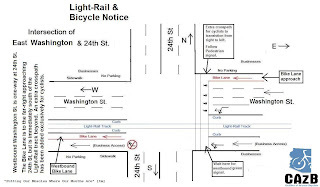 CAzBike Blog: Bike Lanes and Light Rail 7th to 24th Streets along Washington & Jefferson Streets. Bike Lanes and Light Rail 7th to 24th Streets along Washington & Jefferson Streets. 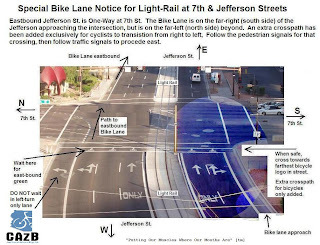 The following is an email thread of discussion of the work the City of Phoenix is doing for cyclists on the subject issues. Below is the response from Mike Cynecki, the City traffic Engineer doing the rework. As you can see, they are making it better, albeit slower than we want. Contrary to what I said is that the 9th St intersection is recognized to be fixed. Richard Moeur suggested a block of shared lane (both sides) along the business / bike roadway, to give a cyclist plenty of leeway as to when to try to move to the right. I like that more than another bike box that I suggested. Richard also suggested a good consultant. What I'm saying is that the City is recognizing the problems and is helping. A total rebuild is not going to happen and antagonizing our friends is going to hurt us. We have a city budget crisis now and future light-rail expansions are coming. They are receptive now to our inputs. Keeping involved and offering reasonable suggestions are our best path. A week ago, I was informed by a cyclist that there is another L-R vs. bike lane area that needs to be looked at. This is between Priest and theTempe Town Lake crossing. Haven't had a chance to look there yet. Use of shared lane markings, while established in some localities, have the same "unfamiliarity" factor as bike boxes in Arizona. Use of either will require education and compliance by cyclists and motorists alike. Trying shared lane markings in an area that was specifically designed for speedy high-volume motor traffic would harm more than help. Further, ARS 28-735 exempts motor vehicle drivers from the penalties when an injury occurs where there is a nearby bike lane. That would not be good. I don't want the introduction of shared lanes to occur in such a motorist-favored area as Jefferson St. between 7th St. and 24th St. I believe we do not want to force good, but less trained cyclists to abandon a good place to ride, namely the business access/bike lanes on the left sides of the tracks. These people will be dis-enfranchised rather than ride in the "slot-car" lanes where the shared-lane markings would be. 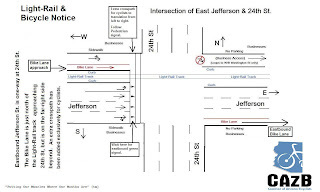 As far as I'm concerned, the whole section of Washington/Jefferson from 7th Street to 24th Street, should have condemnation proceedings lodged against it and removed from any semblence of bikeability in the metro area. The whole section is an abortion in my opinion and should be ripped out and put together correctly (as if that would actually happen), and the all seeing, all knowing engineers that "engineered" this project should be reprimanded and sent for re-education as to what constitutes Bicycle Friendly facilities. I realize that there are some that did not approve of this finished project, but they are in the minority and constitute little political clout. In the meantime, I and many others will avoid the downtown area on our bikes until this exercise in stupidity is rectified! Bob. 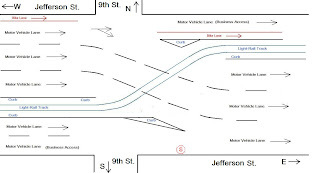 > Subject: Re: 9th St & Jefferson St Bike Lane configuration. > installed, and we will be seeking suggestions for alternate designs. > over to the right side of the frontage road. > actually occur. However, an actual safety issue exists at 9th St.
> light-rail tracks, as part of the business access / bike lanes. > cross to the continuing bike lane. > occur before the car has visually indicated a turn or straight maneuver. > skills we teach in our classes. > the far-left of the business access lane for another block to the east. > ambiguity of what a motor vehicle would be doing. Who is incorrectly labeling in the diagrams the travel lanes as 'motor vehicle' lanes. There is no such thing. They are lanes that can be shared by all types of vehicles motorized or not. Based on the designs I see here sharing these lanes is a must for safe and predictable cycling. Welcome to the official blog of the Coalition of Arizona Bicyclists. News and information affecting Arizona cyclists. Visit our home page at cazbike.org join, renew, or find bicycle safety classes.